The Shadow/Highlight adjustment is designed to rescue two specific sorts of images — you've seen them (and maybe taken them): The background is perfectly exposed, and the person in the foreground is in horrible shadow. Or, equally bad, the background looks great, but the subject is washed out by a strong flash. (See both examples in Figure 5-15.) By controlling the shadows and highlights separately from the rest of the image, this feature helps you restore more balance to the image. Figure 5-15: Shadow/Highlight does a rather good job with these all-too-common problems. The default settings in Shadow/Highlight are intended to repair backlighting problems, as you see on the left in Figure 5-15. When the foreground lacks detail because of flash (as you can see on the right), minimize changes to the shadows and drag the Highlights slider to the right. (Pay more attention to the cheek than the neck — somebody needs a bath!) And, as you see in Figure 5-16, the two sliders in Shadow/Highlight can be used together. Figure 5-16: Some images need help for both shadows and highlights. You'll find that Shadow/Highlight is also a great tool for some other situations, especially when you select the Show More Options check box. Take a look, for example, at Figure 5-17. In the "before" picture on the left, the interesting subject matter is lost in the surrounding greenery. You don't pick out the sculpture immediately because both it and the leaves are rather dark. In the "after" shot, lightening with the Shadows slider, lowering the Midtone Contrast slider, and then boosting the saturation with the Color Correction slider works wonders. By lightening and increasing the saturation, the greens and browns separate themselves, helping you see the subject much better. In the Shadows/Highlights dialog box, the Shadows slider lightens the darker areas of your image, and the Highlights slider darkens the lighter areas. Generally, you'll use one slider or the other to fix a specific problem in an image, but you can use both if you need to lighten shadows and tone down highlights in the same image. Figure 5-17: With lightening and saturation, Shadow/Highlight helps separate the subject and foliage. i Amount: For both Shadows and Highlights, the Amount slider is how much of a correction you're making. This is the nuts and bolts of the Shadow/Highlight adjustment. For a backlit subject, you'll use the Shadows slider a lot and not the Highlights slider. When working with a washed-out subject, you'll probably move the Shadows slider to 0% and work with the Highlights slider. 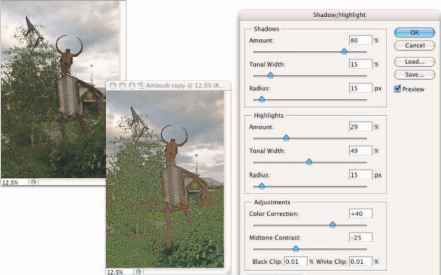 i Tonal Width: Use the Tonal Width sliders to specify how much of the image's tonal range you want to include as shadows or highlights. If you drag either Tonal Width slider to 100%, you're working on the entire tonal range of the image — not a particularly appropriate job for Shadow/Highlight (use Curves instead). The default of 50% is rather too high most of the time. Instead, start your adjustment with a range of perhaps 20% and fine-tune from there. ii Radius: You adjust the Radius sliders to tell Shadow/Highlight which pixels should be identified as being in the shadow or highlight. With too low of a Radius setting, an individual black pixel stuck in the middle of a light area in your image might get classified as a shadow area. Too high of a setting has a tendency to apply the adjustment to the entire image. 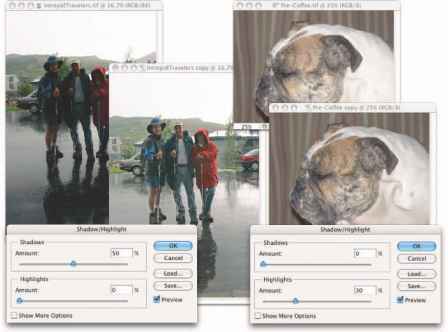 Generally speaking, start with a Radius of perhaps 10 pixels for very small images and 30 pixels for large digital photos. 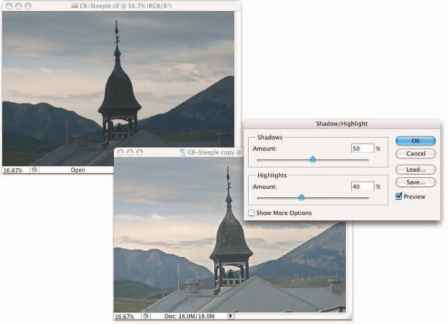 After adjusting your Amount and Tonal Width sliders, move the Radius slider back and forth while watching some of the smaller patches of shadow or highlight (whichever you're correcting) to make sure that those areas are being included in the adjustment. i Color Correction/Brightness: This slider changes its name to match your image's color mode. When working with a color image, you see Color Correction. When you apply Shadow/Highlight to a grayscale image, the slider's name changes to Brightness. Don't bother with this slider until you make your Amount adjustment. In a color image, lightening the shadows or darkening the highlights shows the actual color of the pixels in those areas. Use this slider to increase (drag to the right) or decrease (drag to the left) the saturation of those pixels. Remember that Color Correction works only on the pixels that you identify with the Tonal Width and Radius sliders. (If you set both sets of Tonal Width and Radius sliders to 0%, Color Correction has no effect on the image at all.) When you correct a grayscale image, on the other hand, the Brightness slider affects all pixels except those that are already pure white or pure black. i Midtone Contrast: You can increase or decrease the contrast throughout the image with the Midtone Contrast slider. Much like clicking in the middle of the curve in Curves and dragging up or down, you adjust the whole range of your image, including the shadows and highlights. When the overall appearance of your image needs improvement, start with Midtone Contrast and then work with your shadows and highlights individually. i Clip: Most of the time, you don't want to change the clipping values. 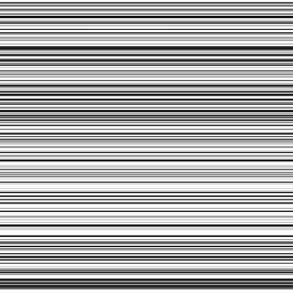 Clipping takes pixels that are almost black and forces them to pure black, or takes pixels that are almost white and forces them to pure white. Clipping your shadows or highlights reduces those subtle differences in color that provide the detail in the shadows and highlights. When would you want to clip shadows or highlights? When you don't care about detail in those areas of your image and need more contrast through the midtones.